All of you guessed correctly yesterday. We did skip town and headed to Paris for the long weekend. It was wonderful. I had never been before and even though we didn’t have a lot of time we managed to squeeze in a few things I’ve always wanted to do. One of them was visiting Versailles. In college I studied history and political science. 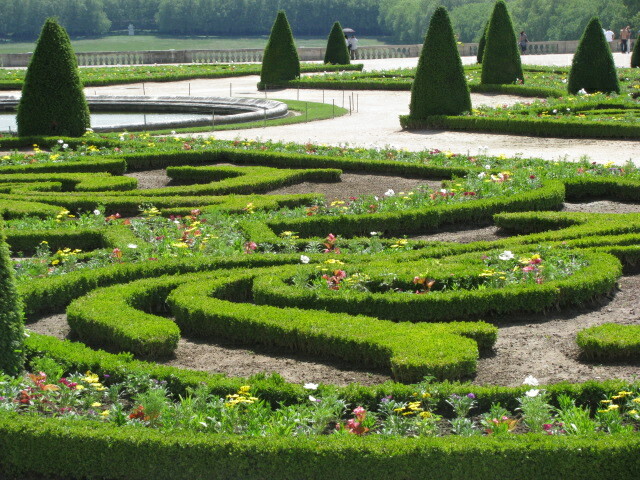 Versailles, as many of you are aware, has played a role in many major turning points over the centuries. I couldn’t visit Paris without going to Versailles. So on our first full day, we arrived late the night before, I found myself wandering through the gardens of this wonderful place. For me, it was magical. I studied it in my history and art history classes and to finally see it firsthand, well I don’t know if I can explain how I felt. I took a ton of photos, but here is one of the first since our tour started in the gardens. This entry was posted in Travel Photos and tagged 50 Year Project, Art History, Blog, Blogging, Europe, European History, France, Gardens, History, Life, Nature, Paris, Photography, Photos, Travel Blog, Travel Journal, Travel Photo, Versailles. Bookmark the permalink. Looks beautiful – could never imagine this in the bustle of Paris! What a gorgeous garden… exactly what I expect from Paris. Paris exceeded all of my expectations…I can’t wait to go back! It really is…I’m glad I did it at this age when I can really appreciate it. If I went when I was a kid or teen I don’t think it would have been the same. Do you manage to go inside the palace itself? Yes! We had a guided tour inside. I took some photos, but to be honest I was in awe that I spent most of the time just soaking it in and admiring the palace. That is exactly what happened to me when I went inside. Amazing to think that so much money was spent on the palace when there were people starving outside. It is no wonder that the peasantry were ripe for a revolution. I can’t even imagine how much money they spent. Of course you can’t just blame Louis XVI and Marie Antoinette for all the problems. France waged way too many wars. Way back in the seventies I was also without words or speechless when I saw these gardens. Awesome! It is a wonderful feeling isn’t it. I know what you mean. I had the same feeling when I stood where the Treaty of Versailles was signed. Woohoo… so glad I guessed correctly. I would love to visit Versailles one day. We had a castle and gardens based on Versailles in Germany… Sanssouci! I remember when we went to visit… it was stunning. Glad you had a wonderful time. I’ll be in Germany this summer, but I think we’ll only have time to see the sights in Berlin. Germany is a country I would love to take weeks to explore. Hopefully it will work out. Thanks for the tip!! I would love to see it. Versailles is a beautiful place! I’m sure the landscaping has changed a lot since I was there…many years ago. Glad you enjoyed your trip! Great photo! It is one of those places that lives up to your expectations and then exceeds them. At least it did for me. Wow, that is beautiful! I sure hope the gardener gets paid well :). Can’t wait to see more of your photos! I wonder how many gardeners they have…the gardens are massive. Yes, they really reminded me of the gardens of the Paleis Heit Loo that we visited when in the Netherlands. So beautiful!!! Reminds me of the historical romance I used to read, great photo and looking forward to seeing some more. Was the novel set at Versailles? I would like to read it. When I was at Versailles, I squinted my eyes a bit, and I swear I could see the horse drawn carriages of old coming up towards the chateau. It’s a magical place and no matter how many pictures or videos you see of it, nothing, nothing prepares you for the opulence. So glad you made it to Versailles, one of my favorite spots in the world. I don’t think I’ll ever get over seeing all those painting on the ceilings. Just amazing. Escaped London on the Jubilee W/end!!!! And miss a chance to curtsy to the Queen!!!!??!! I’m sure Versailles was sooo worth it! !